It is a broken country: the poorest in the western hemisphere, its people traumatised by the shattering earthquake which destroyed so many lives, and prey to a devastating cholera epidemic and continuing violence. A girl with symptoms of cholera is taken to hospital. 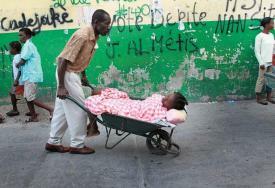 (Getty images) Tomorrow Haiti will go to the polls to try once more to put itself back together. But it does so against as daunting a backdrop as any election to be held anywhere in recent times. The journey to the vote in Port-au-Prince, the first since the "day of catastrophe" last January which left more than 230,000 dead and 1.3 million people homeless, has been suffused with accusations and recriminations and a sense of foreboding. In Champs de Mars, the central plaza which has become a vast tented village of the dispossessed, a Creole slogan painted in blue on the single remaining wall of what was once an office block tells the story. It reads: "The dead shall be heard." But if that phrase carries the strange sense that Haiti's victims remain a reproachful presence in this election, there is also a powerful fear in the capital that their voices will not be heeded, but misunderstood. With little documentation of those killed and missing, identity cards are said to be changing hands for about $5 so they can be used for fraud. In a contest in which each candidate is spending millions, that is small change. I'm packing up again. Children's Hope heads to Haiti this Sunday. This trip will be like no other. While cholera grips the camps, we go to bring in rehydration and antibiotic treatments. 12 thousand are hospitalized, nearly a thousand dead...and cholera's grip is predicted to haunt Haiti for years...sanitation supplies and clean water are nearly impossible for most folks to find. A pall grips the hungry camps, babies rarely even cry, as food distribution to their mothers has been stopped in the camps. Cholera is creeping into the city. 1,000 new beds are being set up in the Port au Prince area as I write. Malnourished children need vitamins and cholera patients need treatment...your donations this trip will go 100% to this relief. On a personal level...I will also be carrying papers to work on adopting two little boys. They are Teves and Dro. 6 and 8 years old. They were found living on the street nearly four years ago...Please keep good thoughts for us...as we hope to bring the boys home early next year. 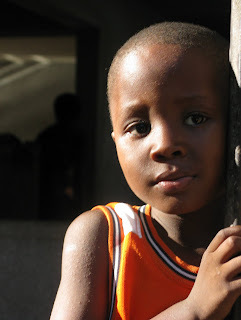 Now, I know that many of you have helped Haiti so much this year, following the earthquake. I am sorry I have not been able to personally send out thanks and photos as I usually do...it seems we barely get home and we are going back again. This is our 6th service mission this year. I wish I could say that things are getting better, but with the recent hurricane and now cholera, it seems we can't catch our breath. Please consider if you can help us spread the word about this humanitarian trip. Since I am the only member of our team going this trip, space is limited. I am carrying in only children's vitamins, antibiotics, and funds to purchase clean water and food. Funds are the most versatile. I have heard from friends there that electricity is worse than usual, but I will send updates as I can. You can text me in Haiti at 916.801.4184...or write me at ChildrensHope@live.com. Please think of the children this Thanksgiving. Go to our blog http://coalitionfordemocracyinhaiti.blogspot.com/ , or simply send a check to the address below.Thank you. “If you let your fear of consequence prevent you from following your deepest instinct, your life will be safe, expedient and thin."